Wahama junior Dakota Belcher, right, releases a shot attempt over a South Gallia defender during the first half of Friday night’s TVC Hocking boys basketball contest in Mercerville, Ohio. South Gallia sophomore Austin Day releases a shot attempt over a Wahama defender during the second half of Friday night’s TVC Hocking boys basketball contest in Mercerville, Ohio. MERCERVILLE, Ohio — It had more twists and turns than even a roller-coaster enthusiast could enjoy. 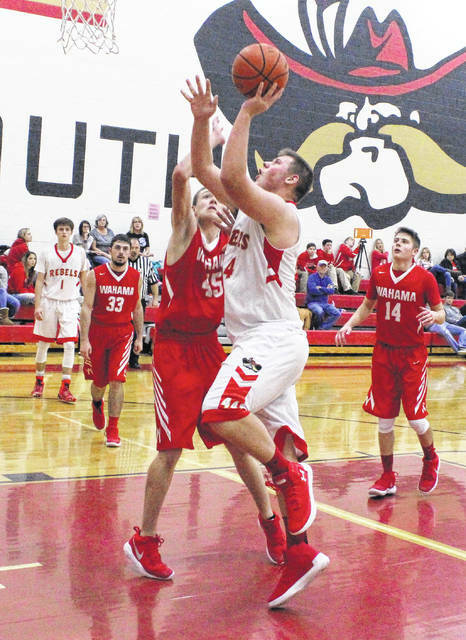 Wahama led only 1:24 over the course of 32 minutes, but the guests found a way to lead when it mattered most on Friday night following a 49-48 victory over the South Gallia boys basketball team in a Tri-Valley Conference Hocking Division matchup of winless teams in Gallia County. The White Falcons (1-4, 1-3 TVC Hocking) scored the first basket of the game, but the Rebels (0-5, 0-3) answered with 15 consecutive points while building their largest lead of the night (15-2) five minutes into regulation. From there, the Red and White never led again until early in the fourth canto — but the hosts quickly countered by establishing a four-point cushion at 48-44 with 2:02 left. WHS, however, got a big three-pointer from Skyler Estep at the 1:43 mark to close to within a single point, then Noah Litchfield knocked down a near-impossible jumper in the lane with 18 seconds remaining to give Wahama only its third lead of the night at 49-48. The Red and Gold had two different chances to pull out the win over the final seconds of the game, but both attempts came up short — allowing the White Falcons to sneak away with their first triumph of the season. Despite committing 19 of the 27 turnovers in the contest, Wahama managed to claw its way back into things by converting in two key areas. The White Falcons made one more field goal than SGHS in 13 fewer chances and also performed better at the free throw line. Given the way that things ended up playing out, WHS coach Ron Bradley was thrilled to get out of South Gallia with a victory. The fifth-year mentor noted that not only did his troops show real signs of growth, but it took a collective effort from everyone to fend off a solid performance by the Rebels. “We did exactly what we needed to do once we got down early. We didn’t panic and we just kept chipping away. You know, we didn’t lead much … but we led when it counted the most,” Bradley said. “We still made a lot of mistakes and gave up a lot of offensive rebounds, but we did a lot better job of things in the second half … again, when we had to have it. Both teams hauled in 26 rebounds on the night, with the hosts claiming a 16-11 edge on the offensive glass. Each squad also made 13 two-pointers in the contest, with Wahama’s extra field goal coming from behind the arc. The White Falcons were also 5-of-7 at the free throw line for 71 percent, while the hosts connected on only half of their 14 charity tosses — including misses on all four of their free throws in the finale. 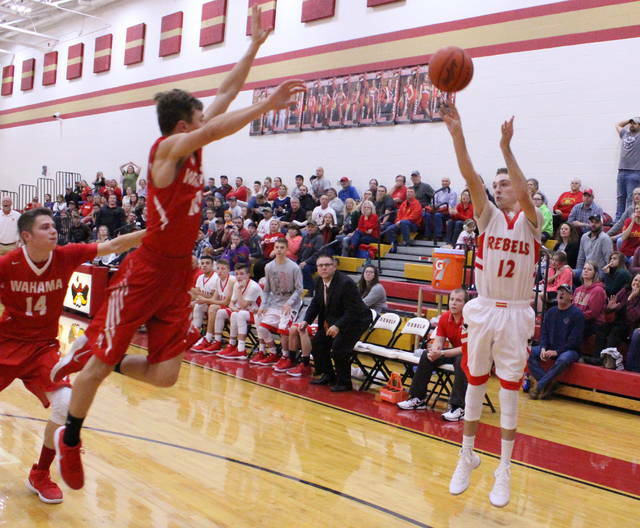 Those little things — according to SGHS coach Kent Wolfe — ultimately ruined an otherwise solid performance by the Red and Gold, as did Litchfield’s game-winner in the closing moments of regulation. “We knew Litchfield was going to get the ball, and he made a great shot because we were all over him. I think it was between a triple-team,” Wolfe said. “We had a play set up if Wahama scored and we ran it to perfection, outside of the shot just not going in. Trailing 48-47, Wahama came out of a timeout with 33.4 seconds left and got the ball to Litchfield at the top of the key. The senior had the ball knocked away by a defender, but recovered and drove inside the lane to his left — where a trio of Rebels were waiting for him with arms extended. Litchfield, somehow, managed to get a contested shot off as he was bumped in the lane — and the ball ended up going through hoop with 18 seconds remaining. South Gallia inbounded the ball to Austin Stapleton, who crossed midcourt and passed the ball over to Braxton Hardy at the top of the key. Stapleton cut through the lane and ended up alone in the left corner, with the White Falcons clearly focused on where Hardy and Eli Ellis were on the floor. Hardy ended up delivering the ball to a wide-open Stapleton in the corner, and the senior released a practically uncontested trifecta that rolled in and out of the rim and into the arms of Wahama’s Dakota Belcher — who was fouled with 3.6 seconds left. Belcher missed the front end of the 1-and-1 opportunity, and Hardy grabbed the rebound. Hardy took a handful of dribbles to the right side of midcourt and launched a desperation trifecta — but the shot never drew iron as the final horn sounded. After falling behind by 13 points early on, the White Falcons answered with a 12-4 run over the final 2:49 to close to within 19-14 through eight minutes of play. The Rebels answered with an 8-4 start to the second canto for a 27-18 lead with 4:34 left, but the guests responded with 10-5 spurt that resulted in a 32-28 halftime deficit. South Gallia’s largest lead of the second half came at 38-29 following a Hardy bucket at the 5:06 mark of the third, but Wahama countered with an 11-2 surge over the final 4:49 to knot things up at 40-all headed into the finale. The guests claimed their second lead of the night at 42-40 following a Belcher basket at the 5:36 mark, then SGHS reeled off four straight points before Wahama answered to tie things again at 44-all with 4:29 remaining. Austin Day and Hardy converted consecutive field goals to give the Rebels a 48-44 cushion with 2:02 left, then went scoreless the rest of the way. 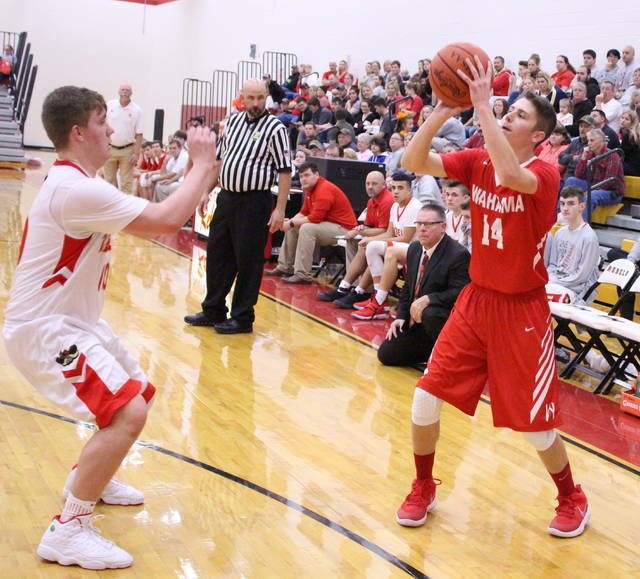 Wahama connected on 19-of-43 field goal attempts for 44 percent, including a 6-of-13 effort from three-point range for 46 percent. The hosts, conversely, netted 18-of-56 shot attempts for 32 percent, including a 5-of-20 effort from behind the arc for 25 percent. Litchfield led the White Falcons with a game-high 20 points, followed by Tyler Bumgarner with eight points and Belcher with six markers. Isaiah Pauley was next with five points, while Estep and Anthony Ortiz each contributed three points. Abram Pauley and Jacob Warth completed the winning score with two markers apiece. Belcher hauled in a team-best nine rebounds and Litchfield also grabbed five caroms. Ellis paced the Rebels with 14 points, followed by Hardy with a dozen and Day with 10 markers. Stapleton was next with six points, Curtis Haner added four points and Bryce Nolan completed the scoring with two markers. Day led the hosts with nine boards, while Hardy and Ellis each collected six rebounds in the setback. 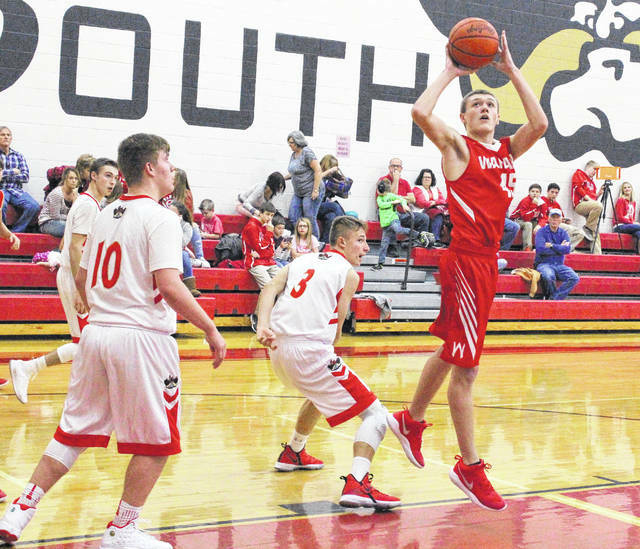 Wahama returns to action Wednesday and Thursday at the Wirt County Tournament, then hosts Hannan on Friday night at 7:30 p.m.
South Gallia returns to action Wednesday when it hosts Federal Hocking in a makeup TVC Hocking contest at 7 p.m. The Rebels will then host Ohio Valley Christian on Friday. This story will appear in the Tuesday, Dec. 26, sports editions of the Gallipolis Daily Tribune, Point Pleasant Register and The Daily Sentinel.